New York State had granted women the right to vote in 1917, three years before the passage of the Nineteenth Amendment made female suffrage the law of the land. This accomplishment was due in no small part to the tireless activism of female suffragists who traveled the state for years, lobbying legislators in Albany, organizing demonstrations, and raising funds for female causes. The Women's Division of the New York State Democratic Committee was formed as a means of channeling the votes of newly enfranchised women towards Democratic candidates, and by the mid-1920s it had become one of the focal points of female political power in New York State. 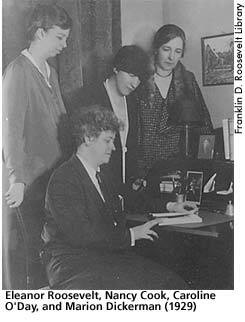 Eleanor Roosevelt began her association with the Women's Division in 1922 when Nancy Cook invited her to speak at a luncheon meeting of the division's members. The collaboration of ER and Cook proved to be the beginning of a long political partnership that would last through the New Deal, and the two women soon became close friends. They were joined in their activities by three other prominent female politicos: Elinor Morgenthau, Marion Dickerman, and Caroline O'Day. Together these five women dominated the Women's Division for the remainder of the 1920s and their dogged support proved invaluable to FDR's success in the gubernatorial election of 1928. Although the Women's Division would grow increasingly less important as women became more integrated into mainstream political life, the contributions of its leaders during the 1920s and 1930s were immense. Caroline O'Day would ultimately become the most prominent female member of Congress in the 1930s, and it must be noted that it was in the Women's Division that Eleanor Roosevelt acquired her early skills as political operative. Cook, Blanche Wiesen. Eleanor Roosevelt: Volume One, 1884-1933. New York: Viking Press, 1992, 319-320, 322, 324, 339-340. The New York State Democratic Committee Home Page. Internet on-line. Available From http://www.nydems.org/ERLP/celebrating.html.